Walmart has Aqua Coffee Table 28 Gallon Aquarium for $639.95. You can also get free shipping or store pickup. This entry was posted in Sale on April 30, 2016 by Crodeal. Amazon has DROK USB 2.0 Digital Multimeter, Ammeter Voltmeter Capacitance & Watt Meter, 7 Modes Multi Tester, DC 3A 12V Amp Voltage Power Meter, Charging System Tester, Fast Charging and Data Sync Dual USB Ports for $8.99. This is 65% off from the regular price of $25.88. Free shipping with a $35 order or free 2-day shipping with Amazon Prime. 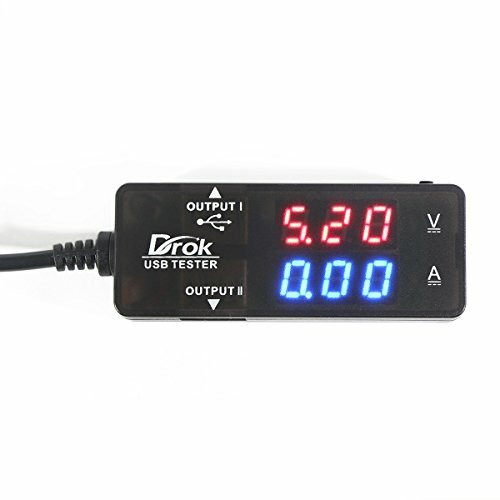 7 MODE USB MONITOR – DROK USB Pocket Digital Multimeter is a very useful tool that can be used to measure voltage, current, capacity, and power going to your phone/battery pack. Use the button to choose between 7 different modes. It is a very handy device to evaluate whether or not the computer, USB wall charger, USB car charger are outputting acceptable voltage and current range for the device you are connecting. DUAL COLOR LED – DROK USB monitor has Dual LED display, with Red and Blue color, which is bright and easy to read. The clear display makes it easy to monitor the charge voltage and current of your digital USB devices to ensure the optimal charge rate. DUAL USB OUTPUT – There are two USB outputs available which can be used simultaneously. USB Output I can be used for device charging and data transfer. Whether you want charge mobile devices, or you want to transfer data between the mobile device and PC, simply plug a device in Output I. The Output II can is for charging your mobile phones, tablet PCs, iPad and other USB devices. Output I Support QC 2.0 9V & 12V charging, but don’t insert any device in Output II when using QC 2.0 Charging. MULTIFUNCTION – This ideal multiple USB Detector can be used for capacitance checking, capacitance clear, over voltage and under voltage alarm, over-current, and short circuit alarm. Using DROK alignment tool, you can monitor output voltage and current of mobile charger cables, power use of raspberry pi or Arduino board, compare the performance of solar charger in different conditions. You can easily test the power/quality of the chargers and USB cables. 100% RISK-FREE SATISFACTION GUARANTEE – We offer you 100% risk-free satisfaction guarantee to let you buy with confidence. No questions asked. So, why think twice? ORDER NOW to get this amazing USB Digital Multimeter which comes with 7 different modes and multi-functions to test your USB cables, wall chargers, car charger with accurate measurements. Target has Philips Sonicare 2 Series Plaque Control Electric Toothbrush White HX6211/04 for $39.99. This is 20% off from the regular price of $49.99. Free shipping for orders over $50.